Yeey, it's here, it's here. Some of you already know, but most do not, that Mark Knopfler is one of my idols. His guitar playing inspired me to pick up the guitar, and his music, khm, lit up the room several times at key moments :-). So, after having seen his concert two years ago (Shangri-La tour, 2005) I was excited to hear the new material he has prepared. Well, after having listened to it, I'm sad to say I'm a little bit disapointed. The mastery of the album an the quality of the music is supreme. The songs are Knopfleresque. They somewhat remind me of the Shangri-La album, and yet it's a big departure from Golden Heart (my favorite). Kill to Get Crimson, then, is at once egoless and supremely accomplished, a testament to the rare talent that enables a master to say something simply and beautifully, and leave it exactly at that. And I would have to agree. The way Mark tells a story with his songs is these days, very rare. One interesting song to me, is Punish the monkey. It talks about being hung out to dry at work, when something is going wrong :-). The deep meaning IMHO is about how the little guy always gets it bad: "somebody's gonna take the fault, there's your quid pro quo". All in all, I wasn't sure what to expect from an artists who continues to evolve. Maybe I wanted something more like Golden Heart... My personal opinion would be 4/5 stars, bascially, if you're a fan of Knopfler, Dire Straits, or quality, soothing music, go and buy it. Image Courtesy of Mark Knopfler News. Oh yeah, so I can still call this a photo blog, I pulled this one out from my archive. This was taken with my first digital camera, the Sony DSC-P72. I only took it with me to record Brothers in arms, and I did :-). 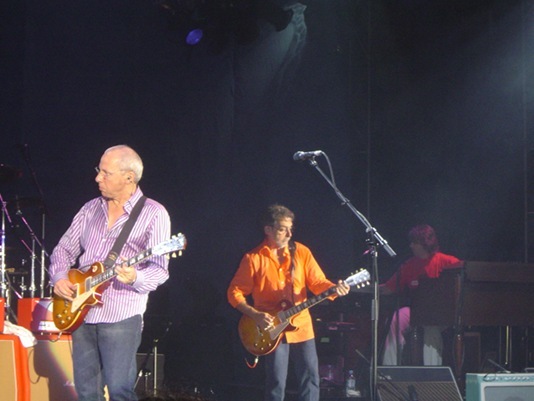 Anyway, on the picture, from left to right, Mark Knopfler, Richard Benett and Guy Fletcher. Tomorrow I'll post a review of the other CD I bought, Nightwish's Dark Passion Play which is (also) interesting because they have a new lead singer!